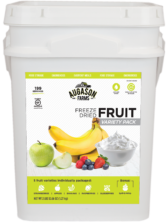 This Freeze Dried Fruit Variety Pail offers you a healthy and delicious selection of freeze dried fruits. As the title suggests, you can enjoy a variety of five fruits and use your culinary ideas to blend them into smoothies, whip up a fruit salad, use in your favorite recipe or eat as a nutritious snack right out of the package. 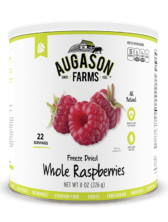 The nutrition of the freeze dried fruits is maintained giving them a long shelf life for emergency food storage or everyday use. What a convenient and economical way to indulge all your fruit cravings. 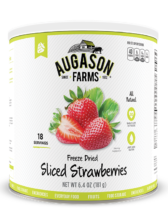 Augason Farms Freeze Dried Sliced Strawberries can be reconstituted for use in any recipe or dish that calls for fresh strawberries such as strawberry shortcake, strawberry milkshakes or to top off your strawberry torte—they’re that good. 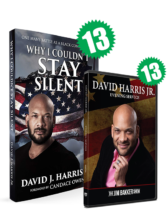 Most people eat them straight from the can for a wonderful, nutritious and uplifting treat. They are an easy and delicious way to get your daily Vitamin C. These delightful, fruity slices are ideal for food storage, everyday use and camping. 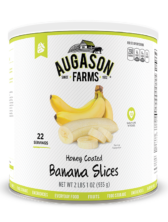 Augason Farms Honey Coated Banana Slices are baked and then cooked with sugar and honey. 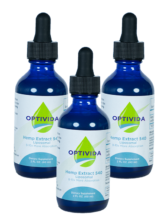 They’re sweet and delicious, without any additives. Use them as a snack or in cooking. Or use them to create nutritious and tasty trail mixes or muesli. 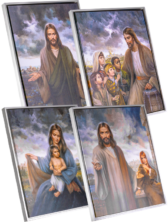 These snacks can be beneficial day-to-day or in a crisis, lifting spirits and providing added energy. 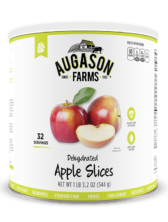 When you taste our Dehydrated Apple Slices, you’ll taste the perfect tartness of fresh picked apples. 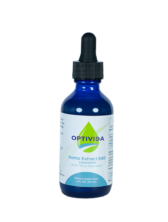 The flavor of this freeze dried food carries through when added to your favorite recipes like oatmeal or apple crisp. It’s also perfect for every day enjoyment and requires no slicing, peeling, or washing. This refreshing drink is delicious and high in Vitamin C, so you can feel good about serving it with any meal! 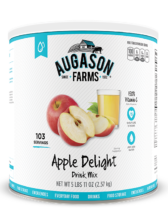 It is also a great starting base to add flavor in any recipe or warmed up for Apple Cider. 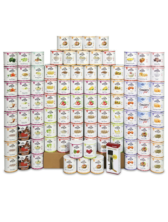 It’s ideal for everyday use, as well as for long term food storage. 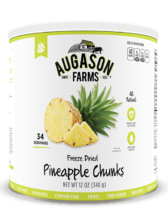 Did you know you can use Augason Farms Freeze Dried Pineapple Chunks in your favorite desserts like pineapple upside down cake or pineapple cobbler? Just add a little water and enjoy your favorite recipes. 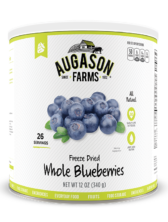 These sweet freeze dried chunks also make for an easy snack and are a good source of vitamin C.